For a company not officially at the Las Vegas-based CES, Apple sure does have a huge presence. Not only is the tech giant molding the smartphone and gadget exhibits, but the Cupertino, Calif. firm also overshadows video vendors. Indeed, Apple’s planned entry into the TV business is ‘the elephant in the room’ at the massive technology trade show. Despite dramatic developments in the video sector, including OLED designs that put traditional LED TVs on a diet, and ultra high-resolution displays that far outdistance current 1080p, most of the talk surrounds Apple’s rumored entry into the TV market. Brian White, analyst with Ticonderoga Securities, tells investors Japanese-based Sharp will provide the display for an Apple television. White makes the claim after speaking with industry insiders. White believes the move could add an additional $102 million just this year to Apple’s already surging revenue. He believes any product will include the Siri voice-recognition system, as well as FaceTime — all powered by Apple’s iOS mobile operating system. Of course, White previously predicted Apple would unveil a TV by the end of 2011, but what’s a few months when you are talking about $102 million? 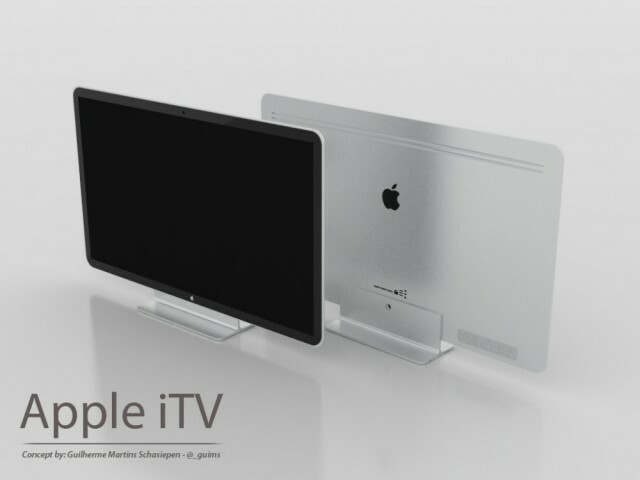 Just what will the Apple TV look like whenever it does appear? Sharp is set to unveil a so-called “4K LED TV” (four times the resolution of current 1080p) sometime in 2012 and is already designing an 8K version. Talk of an Apple TV is also pushing potential rivals Samsung and LG to introduce flatter and thinner sets thanks to OLED technology. Meanwhile, Toshiba is also thinking ahead, preparing a version of 3D TV that no longer needs those annoying glasses. What is crystal clear is that Apple is on the verge of remaking another media industry. Soon, consumers won’t be able to walk into a living room without encountering what’s become a ubiquitous brand.